Fleming H. Revell Company, 9780800733360, 324pp. It is August 1944 and the Gestapo is mercilessly rounding up suspected enemies of the Third Reich. When Joseph Engel, a German physicist working on the atomic bomb, finds that he is actually a Jew, adopted by Christian parents, he must flee for his life to neutral Switzerland. 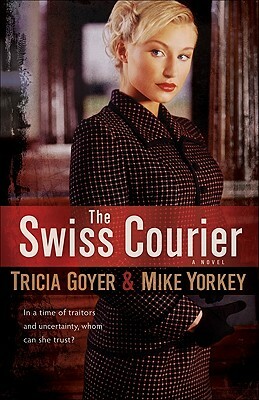 Gabi Mueller is a young Swiss-American woman working for the newly formed American Office of Strategic Services (the forerunner to the CIA) close to Nazi Germany. When she is asked to risk her life to safely "courier" Engel out of Germany, the fate of the world rests in her hands. If she can lead him to safety, she can keep the Germans from developing nuclear capabilities. But in a time of traitors and uncertainty, whom can she trust along the way? This fast-paced, suspenseful novel takes readers along treacherous twists and turns during a fascinating--and deadly--time in history. Tricia Goyer is the author of several books, including Night Song and Dawn of a Thousand Nights, both past winners of the ACFW's Book of the Year Award for Long Historical Romance. Goyer lives with her family in Montana. Mike Yorkey is the author or coauthor of dozens of books, including the bestselling Every Man's Battle series. Married to a Swiss native, Yorkey lived in Switzerland for 18 months. He and his family currently reside in California.